Not a business? Click here to visit our retail store! 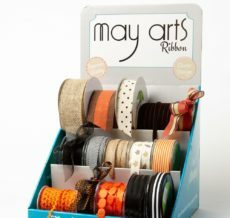 May Arts has striped ribbons galore! With so many styles to choose from, there is a ribbon for any occasion & every project! We carry diagonal, reversible, & metallic in sheer, solid, & grosgrain. Or check out our “tie dye” stripes! Prefer a classic look? We have that too! Sign up to receive special offers and promotions from the crafty people at MayArts.com! How many ribbon spools do I need?